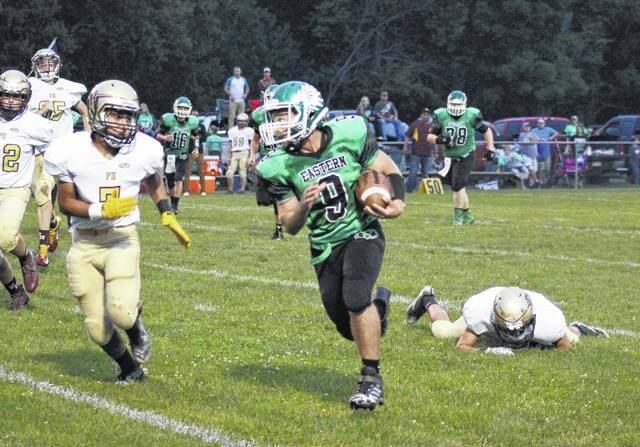 Eastern senior Josh Brewer breaks a long run during the Eagles’ 35-14 victory over Federal Hocking on Friday night in Tuppers Plains, Ohio. TUPPERS PLAINS, Ohio — The Eagles have evened their record. After an 0-2 start to the season, the Eastern football team has made it back to .500, defeating Green a week ago and then claiming a 35-14 victory over Tri-Valley Conference Hocking Division guest Federal Hocking on Friday night at East Shade River Stadium in Meigs County. Eastern (2-2, 1-1 TVC Hocking) marched right down the field on the game’s opening possession, covering 67 yards in eight straight running plays. EHS senior Josh Brewer, who had runs of 18 and 23 yards earlier in the drive, finished the 3:24 possession with a nine-yard touchdown run, giving the hosts a 6-0 lead. 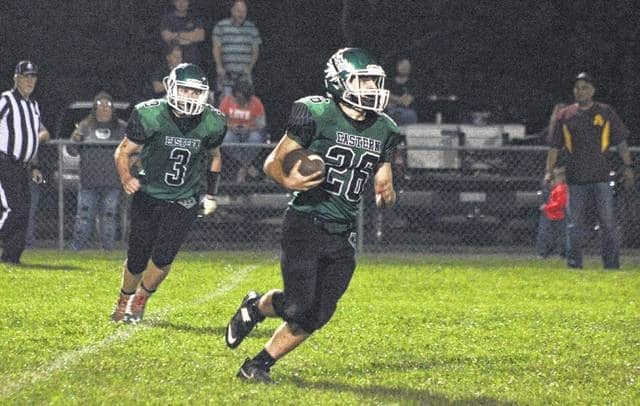 Federal Hocking (0-4, 0-3) — which has now lost 25 straight games — went three-and-out on its first possession and the EHS offense set up shop on the Lancer 33-yard line. Eastern made it as far as the Lancer 19 before fumbling the ball back to Federal Hocking. After another FHHS three-and-out, and a penalty by each side, the Eagles faced a first-and-15 from the Lancer 29. On the first down play, Brewer broke through the middle of the Lancer defense and found paydirt, giving EHS a 12-0 lead with 1:50 left in the first quarter. 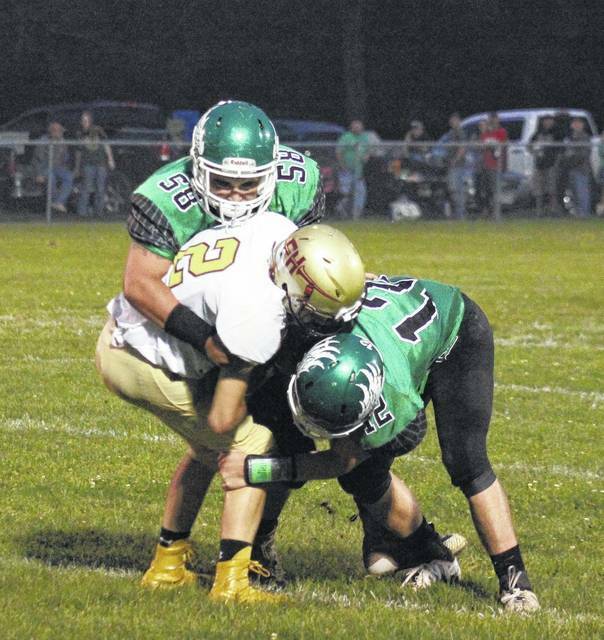 The Eagle defense came up with its third straight three-and-out and Federal Hocking punted on the first play of the second period. After a 25-yard pass from Nate Durst to Sharp Facemyer to start the EHS possession, the Eagles gained another first down on a pair of runs. Facing a second-and-16 from the Lancer 26, Durst found Brewer on a screen pass and the EHS senior found his way to the endzone. Durst tossed a successful two-point conversion pass to Mason Dishong, giving the hosts a 20-0 lead with 10:21 remaining in the half. On the ensuing Lancer possession, facing a third-and-five, Federal Hocking got its first first down of the game on a 34-yard pass from Hunter Smith to Trevor Bell. The Lancers ended the shut out on the very next play, as Smith found Colton Roark for a 24-yard scoring pass, cutting Eastern’s lead to 20-6 with 8:53 left in the first half. On the next drive, the Eagles were forced to punt for the first time in the game, but the kick pinned the Lancers back to their own 10-yard line. Three plays and a failed punt gave EHS possession with less than five yards to paydirt, but the Eagles fumbled the ball back to Federal Hocking with 3:44 left in the half. The Lancers gained a first down before being forced to punt, and Eastern’s offense took possession with 55 yards to go and just 1:12 on the clock. Durst completed 5-of-5 passes and, with the help of one 10-yard FHHS penalty, drove Eastern down the field. As time expired in the first half, Durst found Sharp Facemyer for a three-yard touchdown. Durst ran in the two-point conversion, giving the Eagles a 28-6 advantage at the break. Federal Hocking started the second half similarly to the way Eastern began the game, as the Lancers put together a 10-play scoring. Adam Douglas punched into the endzone from one-yard out and Smith connected with Bell for a two-point conversion, cutting the FHHS deficit to 28-14 with 7:48 left in the third. Eastern punted on its first possession of the second half, but the Eagle defense came up with its fifth three-and-out. On a first-and-15 to start the drive, Brewer broke free for an impressive 70-yard scoring run. Mollie Maxon was successful on the extra-point kick, giving the Eagles a 35-14 lead. After a pair of Lancer punts, sandwiched around Eastern’s third lost fumble, EHS began taking time off the clock. The Eagles did just that, using 12 straight running plays, before a pair of incomplete passes and a loss of downs, to take 7:26 off of the fourth quarter clock. Time ran out on the Lancer offense and Eastern claimed the 35-14 victory. Eastern lost the turnover battle by three, but earned an 18-to-8 advantage in first downs and a 368-to-117 edge in total offense. FHHS threw for five more yards than EHS, 140-to-135, but the Lancers were backed 23 yards on the ground, while the Eagles ran for 233 yards on 36 tries. Eastern’s defense forced the Lancers into six three-and-out possessions in the game. Both teams were penalized seven times, the Eagles for 60 total yards and Federal Hocking for 55 yards. Brewer touched the ball 20 times for the Eagle offense, combining 19 carries and one reception for 231 yards and four touchdowns. Durst, who gained a net of four yards on the ground, was 9-of-14 passing for 135 yards with one score. Blaise Facemyer combined four carries and a game-high five receptions for 83 total yards, Sharp Facemyer finished with 22 total yards on one rush and two grabs, while Steven Fitzgerald finished with 18 total yards on two carries and one reception. 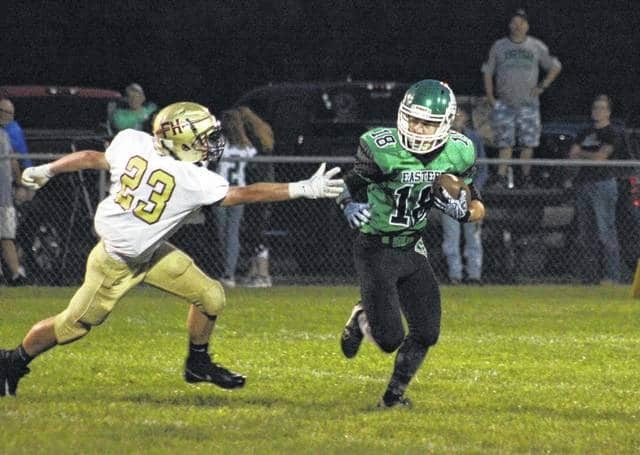 Douglas was Federal Hocking’s only positive gainer on the ground, earning 22 yards on nine carries. Branden Gould hauled in a team-best four passes for 50 yards, Bell grabbed two passes for 50 yards and a score, while Roark and Quinton Basim each caught one pass for 24 and 16 yards respectively, with Roark hauling in a touchdown. Smith completed 8-of-18 passes for 140 yards and two touchdowns in the setback. Eastern has now defeated Federal Hocking in four consecutive meetings. The Eagles will try to make it three straight in the win column on Friday at South Gallia, where the Rebels will also bring a 2-2 record. The Lancers visit Wahama on Friday in a battle of winless teams.